Since the last progress report, the new kitchen is finally beginning to come together. As anyone who has done any construction in the Phoenix Scottsdale area knows, all the trades and crafts shops are busy & booked, & nothing ever gets done as fast as we hope it will. That has been the case here as well. The big delay (almost 3 months) came as a result of my cabinetmaker failing to inform me that the veneer I had ordered was no longer in production. By the time I selected a new veneer and got samples to look at, the completion of the new kitchen cabinets had been pushed back almost 4 months. 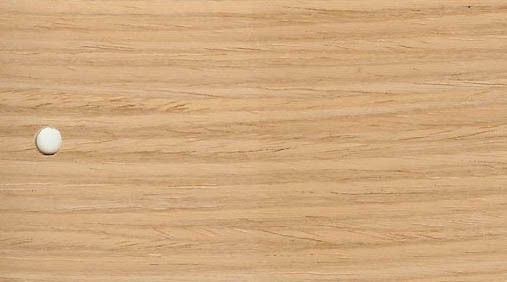 The veneer chosen is a high quality horizontal straight grain white oak made by “Tree Frog”. The photo below is a close up of an actual sample roughly 1.5” X 3”. The finish is simple clear satin polyurethane, which, with clean matt black industrial style hardware and matt black stiles between the drawer and door fronts give the cabinetry a clean and contemporary look. I would recommend either a dark granite or slate countertop as a proper contrast to the veneer and the “Tecate” tile floor. NOTE: “Tecate” tile is similar to “Saltillo” tile but with a reddish brown rather than a yellowish brown finish. It is hand made in Tecate Mexico. The floor is accented with rustic looking 4” X 4” pieces of tumbled black marble. 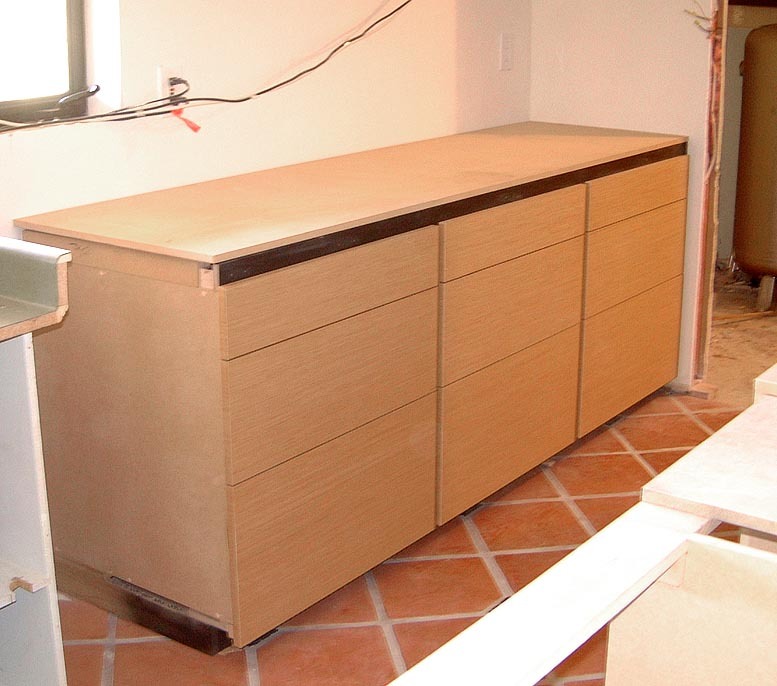 The cabinets have now been delivered, and as the photos show, are starting to be installed. 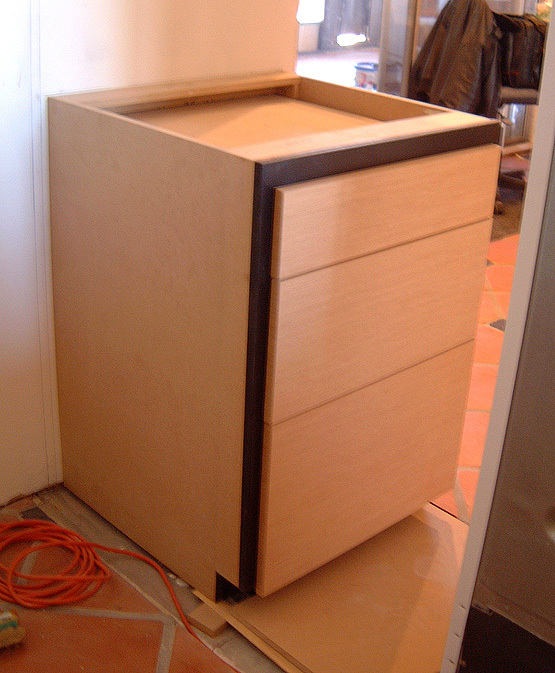 (NOTE: In the following photos, the hardware (the drawer pulls) have not yet been installed, and a temporary plywood top is being mounted over the cabinets so that the purchasers scan choose their own counter-top materials. The photo above shows the new cabinet to the right of the 48” Sub Zero fridge presently residing in the garage… Hopefully it will be in place by the end of this coming week. The new center Island with the 48”: Thermador Professional Series gas cook-top is also beginning to take shape. An appropriate brushed stainless steel vent hood will be suspended from the ceiling directly over the cook-top making it possible to produce gourmet meals using high heat sauté and grilling techniques indoors in a comfortable and smoke free environment. 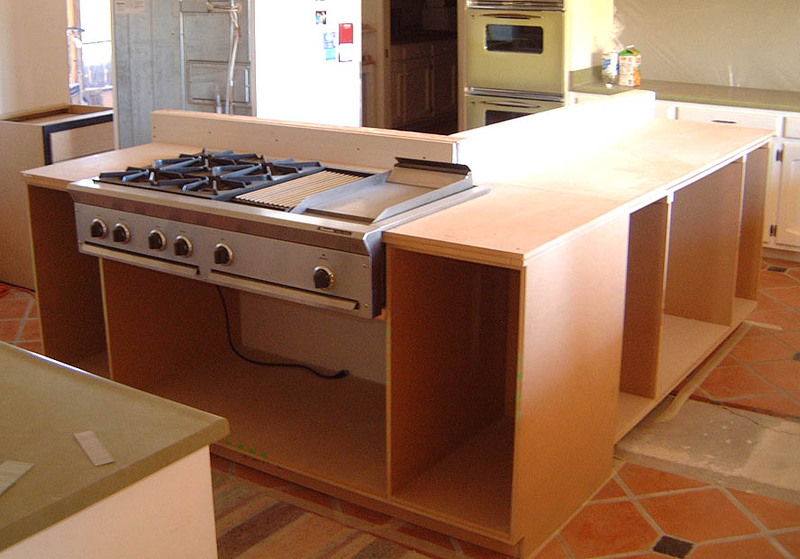 The photo above shows the frame of the center island with the cook-top temporarily in place for measurement purposes. The gas and electric feeds are being run in chases cut into the concrete floor in the center of the kitchen where the wall from the original laundry room was removed. After that work is complete, the existing tile floor will be stripped prior to filling in the empty space with matching tile and black marble inserts. The floor will then be stained and sealed. After preparation, meals can be enjoyed at the “L” shaped “Breakfast Bar” being built on the inside of the center island, or in the formal dining room. One of the disappointing details of my recent move is that I do not have room in my new home for my dining table, seen in the photo below. This artist designed, custom built (one of a kind) table was made using 3 planks of solid Honduras Mahogany each 3” thick, by 18’ wide by 12’ long. These pieces were joined professionally with biscuits and glue and then cut to the finished size of 44” X 136” with curved corners and bull-nosed edging, The table top has just been sanded down and is being treated to a refinishing with 12 coats of hand rubbed tung oil, with ultra fine hand sanding between coats. When finished it will be buffed out to a stunning and durable shine. The top rests on a massive steel base of modern design consisting of 4 massive steel legs joined by crisscrossed 8” tall solid steel flat beams. The steel was finished with a pattern of irregular circular grooves created with a random orbit sander with coarse sand paper. An automotive black lacquer was rubbed into the grooves after which the base was shot with an automotive clear-coat finish. It is truly stunning. A version of this table with a thick glass top sold for $27,000 at the Pace gallery on 57th Street in NYC back in the mid 1980’s. 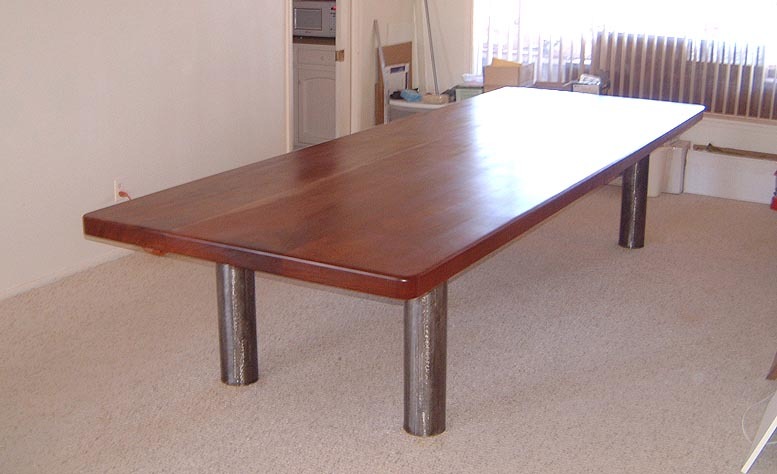 I have no idea what this massive table is worth today, but hopefully the eventual purchaser of this home will fall in love with it as I did, and let it stay in this dining room if for no other reason that it would take an enormous effort to move it. (The top alone weighs several hundred pounds). The table easily seats 14 people and has frequently been referred to by guests as a medieval “groaning board”. Unfortunately it simply doesn’t fit into my new “castle” and the thought of cutting it down to a smaller size is truly depressing. More photos will be added to this update as the work progresses. Thank you for your interest. 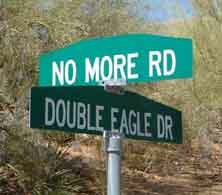 kidding about the address !